The South China Sea does not belong to any one nation and the United States will continue to sail and fly wherever international law allows, U.S. Vice President Mike Pence said on Friday, in a challenge to China which claims the waterway. The United States has conducted a series of “freedom of navigation” exercises in the contested South China Sea, angering China, which says the patrols threaten its sovereignty.“The South China Sea doesn’t belong to any one nation, and you can be sure: The United States will continue to sail and fly wherever international law allows and our national interests demand,” Pence said. 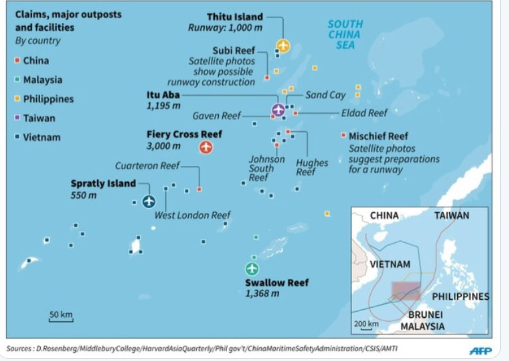 China, Brunei, Malaysia, the Philippines, Vietnam and Taiwan, all have claims in the South China Sea, through which some $3 trillion of shipborne trade passes each year. Pence on Thursday told leaders of Southeast Asian nations there was no place for “empire and aggression” in the Indo-Pacific region, a comment that could be interpreted as a reference to China’s rise. Speaking to a regional summit, Pence directly criticized China’s action in the South China Sea, according to a transcript of his remarks.“Let me be clear: China’s militarization and territorial expansion in the South China Sea is illegal and dangerous. It threatens the sovereignty of many nations and endangers the prosperity of the world,” he said. Technically a portion of it belongs to Vietnam Korea and Japan. Meanwhile on Philippines, acting chief Justice Antonio Carpio rebuffs President Rodrigo Duterte saying China does not possess the South China Sea. Does China possess every islands? South China Sea belong to China, Taiwan, Vietnam, Philippines, Malaysia, Singapore, Indonesia and Brunei, not only China. Words can be significant. Names can affect how others think about something. South China Sea belong to China, Taiwan, Viet﻿nam, Philippines, Malaysia, Singapore, Indonesia and Brunei, not only China. ^This is according to Taiwan, Viet﻿nam, Philippines, Malaysia, Singapore, Indonesia and Brunei. But according to China, it belongs to China. Under normal circumstances, any time two parties disagree to property rights, they must take their cases to court, and the judge decides. This actually happened in 2016 with an international court, which decided against China. Unfortunately, it makes absolutely no difference whether a judge rules one way or another. What matters is whether the police enforce the judge's ruling. So the real question is what happens when China has more guns than the international police? There is a reason why China is racing to build its military.